Welcome to the deep blue world of Shark Reef. Here you will come face-to-face with some of the earth’s most fascinating creatures in North America’s only predator-based aquarium and exhibit. See sharks of all kinds, along with sawfish, giant rays, endangered green sea turtles, piranha, moon jellies and the rare golden crocodiles. In all, there are over 2,000 animals in 1.6 million gallons of seawater. In keeping with the resort’s tropical theme, it features a saltwater aquarium, the Shark Reef Aquarium, which contains the third largest tank in North America. 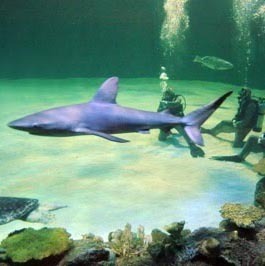 Shark Reef Aquarium contains numerous other exhibits, including two tunnel-shaped, walk-through aquarium. Dive certified Mandalay Bay guests will now have the opportunity to SCUBA dive in the 1.3 million gallon, 22 foot deep Shipwreck Exhibit, surrounded by sharks, rays, sawfish, green sea turtles and schools of fish.